This is also called the 7 Pot Lava Red. 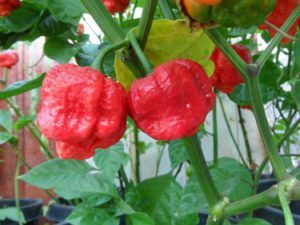 It is a cross between the Moruga Scorpion and the 7 Pot Primo. It was first crossed by a grower named Judy from Tennessee. It has a very high heat level like other Scorpions. The flavor is somewhat fruity. The peppers themselves have Scorpion look to them. It has been around a few years as of 2015. The peppers are pretty uniform and consistent. But expect some variations as it is still a new strain. 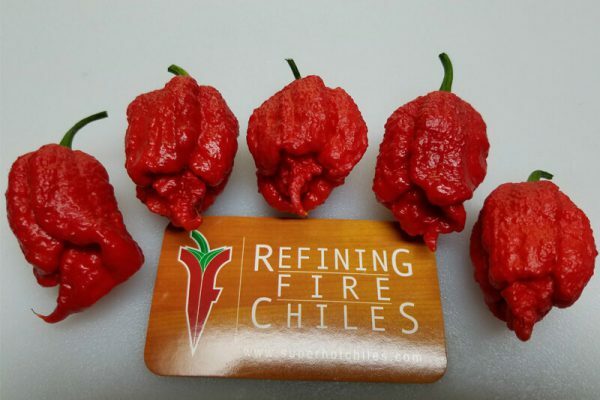 The 7 Pot Lava Red chile plants grow to an average of 3 to 4 feet in height. This is also called the 7 Pot Lava Chocolate. The original is Red colored so this is the Chocolate variant. 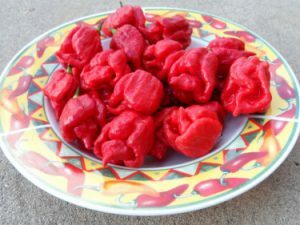 It is a cross between the Moruga Scorpion and the 7 Pot Primo. It was first crossed by a grower named Judy from Tennessee. It has a very high heat level like other Scorpions. The flavor is somewhat smoky fruity. The peppers themselves have Scorpion look to them. It has been around a few years as of 2015. The peppers are pretty uniform and consistent. But expect some variations as it is still a new strain. The 7 Pot Lava Chocolate chile plants grow to an average of 3 to 4 feet in height. The Chocolate variant seems to carry more heat than the red. This is also called the 7 Pot Lava Yellow. The original is Red colored so this is the Yellow variant. 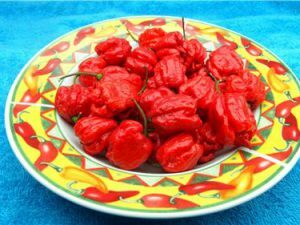 It is a cross between the Moruga Scorpion and the 7 Pot Primo. It was first crossed by a grower named Judy from Tennessee. It has a very high heat level like other Scorpions. The flavor is somewhat citrus fruity. The peppers themselves have Scorpion look to them. It has been around a few years as of 2015. The peppers are pretty uniform and consistent. But expect some variations as it is still a new strain. 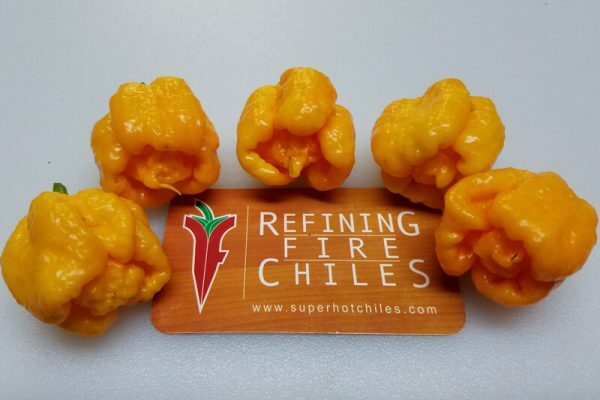 The 7 Pot Lava Yellow chile plants grow to an average of 3 to 4 feet in height. This Yellow variety seems to carry less heat than the red. 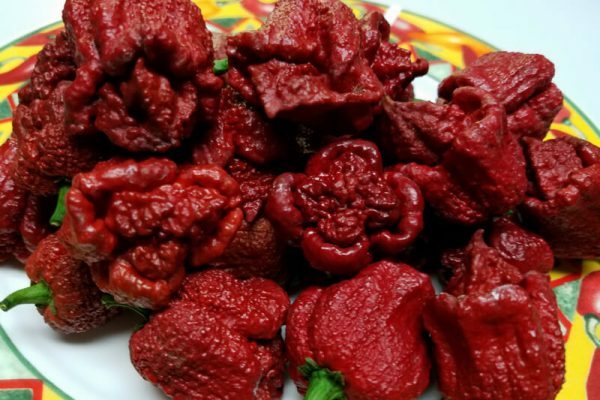 ”At Refining Fire Chiles we isolate our seed production plants to avoid cross-pollination with other chile species. 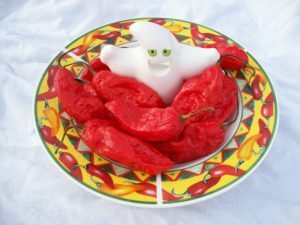 If you want to grow your own chiles, you can purchase seeds right here, or full plants (April-July) and have fresh chiles by September. © 2019 Super Hot Chiles.